Do not think of posters as ‘the less good option’. 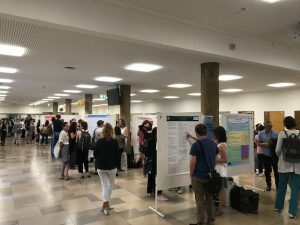 Aim for a really good quality poster session! The venue. Consider that there has to be enough space between posters to allow for the presenter+a small audience (and not too much noise overlap – you want to be able to listen to one person without straining to block out the presenter next door!). It is also desirable to have enough space around each poster to allow for audiences to be able to see each poster without developing a crick in their neck. Generally, landscape is better than portrait format. The final choice will depend on the stands available, however. Consult some of the poster preparation websites suggested below. Poster boards mounted on stands will be provided by the conference organisers. The stands are 130 cm wide and 90 cm high. You should place your poster on the board during the 30 minutes immediately preceding the start of your session. Pushpins will be available in the room. Materials must be removed promptly at the end of the session. Prepare a label for the top of your poster space indicating the title of your paper and the authors. Have copies of your paper available for distribution to interested persons or be prepared to take names and addresses for subsequent mailings. Avoid unnecessary detail in figures, drawings and charts. Your poster should be self-explanatory, so that you are free to answer questions and discuss your research with interested persons. These are both excellent sources of helpful information for producing effective posters. They provide visual examples as well.